It was more than twenty five years ago that Wanaka cast its spell over philanthropists, art patrons and great outdoor enthusiasts Martyn and Louise Myer, of the Australian Coles Myer retail store family. 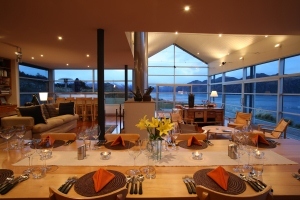 Not only did they continue to return year after year with their kids to ski, run, kayak, mountain bike, climb and hike, such was their love of the area that they then went on to build the elegant Whare Kea Lodge, and later their mountain Chalet high in the Southern Alps. Louise Myer gave the lodge its special flare and its spirit of place. She was recently awarded the prestigious Relais & Chateaux Woman of the Year Trophy 2013 for her dedication to the fresh, light, seasonal cuisine served at Whare Kea Lodge and Chalet and for her beautiful book, WANAKA: Earth to Heaven at Whare Kea,* which celebrates the Wanaka region, with recipes by the lodge's renowned chef, James Stapley. It was more than 25 years ago that you fell in love with Wanaka - what was it about the place that attracted you? I was introduced to Wanaka by my husband Martyn, who is passionate about the mountains and adventure sports such as heli-skiing. I remember we took a summer scenic flight around Mt Aspiring and it's pristine glaciers and it was totally awe inspiring. I had never seen anything like it - the ice falls, snow caves, crevasses and the amazing glacial blue of the tarns and glaciers. We were both blown away by the sheer natural beauty of Wanaka, the irridescent lake and Southern Alps as a backdrop. It was a small picturesque resort town, and still is, and we just fell in love with it. 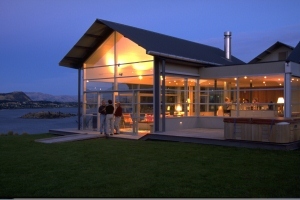 What inspired you to share Whare Kea Lodge and your passion for Wanaka with the world? designing the property of our dreams, we wanted to share it with other like minded people, particularly those who have never travelled to the Southern Alps and been able to experience the array of wilderness activities they offer such as resort and heli-skiing, mountain climbing, flightseeing in vintage aircraft, walking in native beech forest, and eco-tours of the lake. 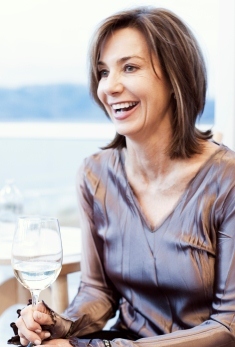 Congratulations on being named Woman of the Year by Relais & Chateaux for 2013 - you are obviously passionate about the food offered at the lodge tell us more about why it is so important? My parents were involved in establishing vineyards such as Taltarni, Warrenmang and Landsborough in the North Pyrenees of Victoria, and also enjoyed being members of the Ballarat Wine and Food Society. They are also gracious entertainers and so food has always been a major part of my life. I attended La Varenne in Paris and following, worked in Melbourne as a chef. I have always been especially interested in food which is light, fresh and healthy, which is so important for general well being. At Whare Kea every evening, we offer our guests an elegant, seasonal five course dégustation menu and so naturally, each course must be carefully sized and nutritionally well balanced. We use only the freshest local produce, sourced by the lodge's chef, James Stapley, from the region's artisanal producers and suppliers, with most of the vegetables and herbs from his own organic gardens and freshly picked that day. Our cuisine is artistically presented and entices all the senses. What is the single/best defining thing about Whare Kea? Without question the location of both Whare Kea Lodge on Lake Wanaka and Whare Kea Chalet set at (at 6,000ft/1750m) opposite Mt Aspiring and glaciers, and accessible for lodge guests via a twenty minute helicopter flight. The relaxed ambiance of the lodge interior with its classic furnishings, artworks by New Zealand artists, together with superb food and service, immediately makes our guests feel welcome and relaxed. I believe today's travellers are looking for authentic experiences. It is about staying at stylish boutique hotels that are often owner operated and use the best local guides and tour operators. The cuisine offered reflects the region where they are located. The Relais & Chateaux philosophy embodies this with its requirement for all properties in the group to express the 5C's; Character, Charm, Cuisine, Courtesy and Calm. There are many factors which contribute to the 'luxury' tag such as design, ambiance and service, but I will not return to a hotel by choice if the bed is uncomfortable. Four Seasons Istanbul has superb beds covered with Frette linen. I have to say the Aman resorts for their amazing sense of place that stems from the architecture and atmosphere of the various properties. I will never forget our experience in the Kingdom of Bhutan trekking from one Aman property to the next, starting with serene Amankora in the Paro Valley that references the local Buddhist monasteries or zongs. It was a great way to see and experience the Bhutanese culture in great style. London. Martyn and I took our 3 children, Edwina, Lucy and Max, to live in London ten years ago for a year. We immersed ourselves in all of the cultural aspects that make the city exciting, attending the theatre every week, exploring all of the wonderful museums such as the Victoria and Albert Museum, the National Gallery, the Tate Modern, and galleries such as the Saatchi Gallery. There have been many including Arzak and Akelarre, both in San Sebastián, and Hélène Darroze, Paris. An overall experience that was special was Nobu, London, which I chose for a 50th birthday dinner for Martyn attended by thirty of our friends. The setting was a beautiful private room, and the Japanese fusion food and service were impeccable. Qantas always looks after us well. I like the cabin design by Australian designer, Marc Newson, and the simple, flavourful menus by Neil Perry and fexible meal service. My husband and I are fortunate to be members of the Chairman's Club and we are looking forward to the joint venture with Emirates, as they are offering full reciprocal benefits. Reading glasses, La Prairie eye cream and my iPhone. We were privileged to stay in a friend's atmospheric 18th century Hunting Lodge in a valley off the Val D'Aosta in Italy. The lodge is only open for 3 or 4 months a year and they have another residence further down the mountain for the cooler months. The view down through the Val D'Aosta and up to the peaks of the Matterhorn was quite spectacular. This is a privately owned operating farm still working in the traditional way which is rare nowadays. Cattle adorned with tinkling bells live at 2500m during the summer months, and are then taken down to the lowlands in winter. Fontina cheese, a speciality of this area, is still being made in the old fashioned way in a hand turned wooden churn. We fished in the alpine lakes and cooked our own meals. In the evening, we dined in baronial style surrounded by mounted hunting trophies. Money does allow you to travel quite literally and experience extraordinary parts of our world. It allows you space whether a lovely suite in a glamorous hotel, or the ability to be out exploring a remote, beautiful area. Money can't buy freedom from man made noise. *, Wanaka: Earth to Heaven at Whare Kea, words by Michal McKay, photographs by Kieran Scott. The book is available online at wharekealodge.com, and Fishpond.com.au, and in Australia at Lesley McKay's Bookshop Paddington in Sydney, and My Bookstore by Corrie Perkin, Hawksburn in Melbourne, and in select Myer stores in Sydney and Melbourne.